Suspended solids in water comes from inorganic particle like silt clay etc,organic particle like plant fibers,algae plankton etc ,immiscible liquid like oils,grease etc. it makes the water aesthetically displeasing .it provide adsorption sites for chemical and biological reagents .they may be biologically active and form disease causing organism .it leads to incrustation in pipes and reduces their discharge carrying capacity . Measurement of suspended solid is done by gravimetric technique i.e. suspended solide measured by weighing them. and measuring the residue.Suspended solids is obtained by filtration and heating the residue on filter at 104 C .
Dissolved solids =total solids -suspended solid . Organic solids both in total and suspended form can be determined by firing the test sample and residue in muffle furnace at 600-650 C .At this temperature organic organic solids will be vapourised leaving behind inorganic solids. AS per Enviromental protection Agency permissible limit of suspended solids is 30 mg/l. 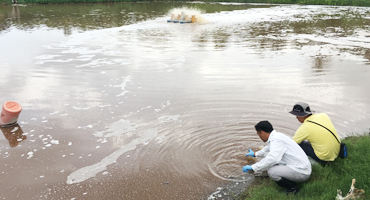 Turbidity is the measure of extent to which light is either absorbed or scattered by suspended materials in water however it is not a direct quantitative measure of suspened solids . a. Disinfection of turbid water is difficult because the suspended solids may partially shield the organisms from disinfectant . 2.In natural bodies ,turbidity interferes with light penetration and hence with the photosynthetic reactions. Color is caused be suspended and dissolved matter in water reffered as apparent color.After suspended matter causing color is removed by centrifugation, the color obtained is called true color. Measurement of color is done by color matching techniques (tintometer ).the color testing is done within 72 hours of collection as otherwise biological or physical properties may change. Cause for rejection is 25 TCU. Taste and odour are caused by dissolve gases like Hydrogen sulphide methane ,organic matter or from inorganic matter. Sulpher imparts rotten egg like taste and odour .Algae secretes oily substances that may result in bad taste and odour. The taste and odour causing compounds may be carcinogenic. Odour is generally measured by an instrument known as osmoscope by diluting the water sample up to an extant it is hardly detectable.Intensity of taste and odour is expressed by TON .It represents the dilution ratio at which is hardly detectable. Temperature affects the chemical and biological reaction.An increase in 10 C almost doubles the biological activity .For water supply ,the temperature should be betwwen should be between 10-25 C.